Vikram S Kirloskar, owner of Kirloskar Systems Ltd. a holding and investment company involved in Real Estate is the partner in the joint ventures with Toyota. In this exclusive conversation he reflects back on a career that has been truly illustrious. He is an engineer by profession and passionate industrialist. He has been working in the manufacturing and automobile industry since 1981 – a whopping 36 years and still believes in learning each day. Vikram S Kirloskar is part of the family that has entrepreneurship in its genes. The Toyota businesses in India include the several companies where Kirloskar Systems is the partner. These are the Kirloskar Toyota Textile Machinery Pvt. Ltd., manufacturing Spinning machines, Aluminum die-casting and auto components, Toyota Kirloskar Motor Pvt. Ltd., manufacturing cars, Toyota Kirloskar Auto Parts Pvt. Ltd., manufacturing Axles, drive-shafts, transmissions and engines and Denso Kirloskar India Pvt. Ltd., manufacturing heat exchangers and AC. Born in November 1958, Vikram graduated from Massachusetts Institute of Technology (MIT) USA with a Bachelor of Science in Mechanical Engineering and has trained in various companies in India and abroad in different capacities. Vikram started working in the family business after college, starting with Production Engineering. He designed and developed many processes and machine tools early in his career. He was involved in opening the import licensing for capital equipment while serving on the Government’s Development Council for Machine Tools in the late 1980’s. He has also served as the President of The Central Manufacturing Technology Institute in Bangalore. He continues to serve on the National Council of the Confederation of Indian Industry. He also serves on the Government of India Development Council for Automobiles and the National Council for Electric Mobility. He is also Vice President, Automotive Research Association of India and the Past President of the Society of Indian Automobile Manufacturers. He is also involved in many activities at MIT and serves on the Visiting Humanities Committee and Educational Council. A fourth generation member of the Kirloskar Group started in 1888, Vikram loves building factories by his own admission. The Kirloskar Group manufactures pumps, engines and compressors and other related products. He is the Chairman and Managing Director of Kirloskar Systems Ltd. and Vice Chairman of Toyota Kirloskar Motor. 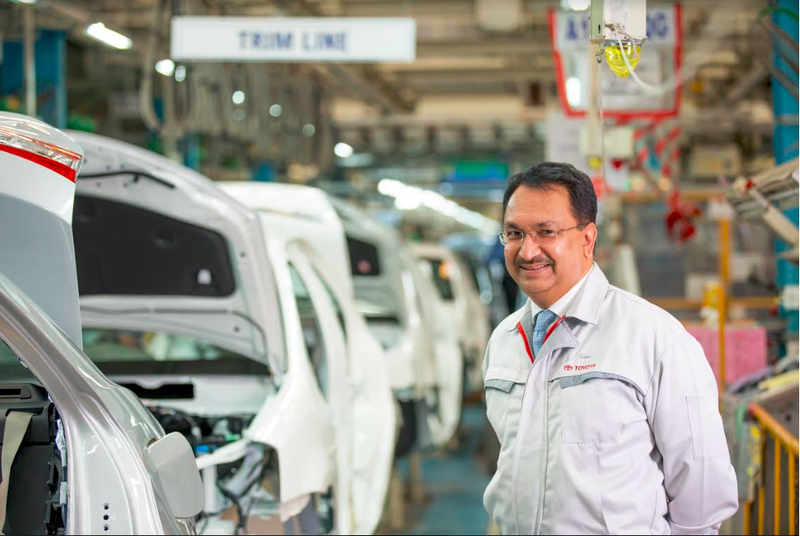 He lives in Bangalore and is responsible for partnering the Toyota group and starting a major automobile manufacturing industry in the state. For this he has been recognized by the Government and presented with the “Suvarna Karnataka” award. Vikram has considerable experience in all aspects of manufacturing having developed at least 25 Greenfield sites over the last 30 years. Both he and his wife Geetanjali golf regularly and spend a lot of time travelling and exploring. His daughter Manasi is now looking after the family business as a full time employee. He tells us more in this exclusive tête-à-tête. You come from a family with a huge business lineage. When you started out initially did you feel the burden to perform? Of course there was a burden to perform. I had just graduated from MIT and expectations were high. However, at that time there was no such great competition in India as it was the licence Raj. That way there was no competitive pressure. Then it was just that you did what you were told to do as a trainee and worked very hard. So that was it unlike now when there is a lot of pressure from competition. Do you feel that your education has helped you take a head start in your business in the initial days of your career? Kirloskar’s business revolves around engineering and my engineering education at MIT helped me immensely. In fact the first 4-5 years of my career were all in the factory as an engineer and as I studied engineering and did a lot of practical work at MIT so all that helped a lot. Also I was involved in different aspects of the manufacturing aspect in the initial years so the education came handy. How did you manage so many diverse businesses in the initial days of your career? I was a trainee in manufacturing at Kirloskar Cummins in Pune when I started work in Kirloskar. So I did not have to worry about any diverse business. I was expected to improve quality and productivity on the shop floor. I put a lot of effort in introducing new innovations and technology. I was always in manufacturing business and all the diverse businesses that came up were the ones I started. So I never looked after two or three things at the same time, I was always looking after one thing. However when I was in the machine tool business it was quite tough and we started to look at doing different things. First we started with textiles along with Toyota and then I thought we must get into the car business as well. This was because I felt that this is where could see the best manufacturing company in the world from inside and use the learning’s in our own Kirloskar factories. If you look at my whole business career there is not much diversification really, it has always been about engineering and manufacturing. Like I say it is always about building on strengths you have and mine lies in understanding how a factory works, how to set it up and how to build it. I do not get involved too much in marketing but I have a good relationship with my team, dealers, suppliers and the whole value chain. So basically all this is metal manufacturing not electronic manufacturing. And when you get into the automobile sector it just becomes very large. What has been the most challenging business problem that you have faced and how have you dealt with it? In hindsight there have been basically two or three kinds of problems. The simplest are the technical problems which look big and most challenging when one is immersed in them but can be dealt with in a systematic manner. The second specific business problem I had when I was in Mysore Kirloskar and most of our revenue and profit was in sales to Russia and Germany and both markets collapsed in the same year. This was a very difficult situation and we made every effort in developing new products to new markets but never really could solve the business issues in the long run. The third problem is a challenge that all business managers face all the time that is human resource development and retention. I have finally started understanding that the basic way to work on this issue is through mutual respect. My grandfather S. L. Kirloskar always inspired me. My father Shreekant Kirloskar died early but I value everything that I learnt from him especially his emphasis on mutual respect and HR development. What inspires me? Manual skills! I admire people who can make absolutely world class products with their hands and developed skills, like artists, carpenters, weavers, potters, musicians, chefs, wine producers. Was it hard to exit the family business a few years back? About 8-10 years ago, my cousins and I would look after different parts of our businesses and I looked after manufacturing in our whole group. So I got involved in setting up and approving capital equipment as well as improving manufacturing practices across the whole group. I have designed and built a lot of new factories and if you ask me what is my big strength I would say it is building factories. I am still very much in the family business. We have reorganised our shareholding so that we can focus better, but my cousins and I are part of the Kirloskar brand and values and we consider ourselves and our children as privileged and fortunate to be a part of this great family. How has your association with Toyota been when you look back now? I started with Textile Machines 20 years ago and am now involved with Cars and parts, Forklifts and insurance. I believe that the basis of our relationship is mutual respect, shared values and a love for monozukuri (Japanese for manual skills). For me everything is about learning and I believe you learn something new every day. That is important. You learn from mistakes you make, try to correct them and learn from them and that is how you keep going on. Knowledge and learning is very important. More importantly recognizing your mistakes, accepting and learning from it is the only way you build experience. What are some of the key learning’s you have had in your journey as a businessman? I am a passionate engineer and used to think that all problems can be sorted out by engineers. I have learnt through experience that the best businesses are like a complex musical symphony where each musician is equally important and has a specific purpose. The Conductor’s job is to make sure they all start and finish on time and play each instrument to its specific music. What is your advice to young entrepreneurs? I have been asked this several times and I will only say this – focus on your strengths and add value. Build on strength, build on your knowledge by learning and have humility, those are the three things I always say. Your daughter is now taking on the mantle of many businesses, what is your advice to her? She is now working with us full time and I tell her the same thing – focus on your strengths. Respect and learn from the people around you and be honest and humble. What is your involvement with your wife’s hospital project? The hospital was completely her idea and passion. I worked on converting her ideas into a physical asset through design and project management. I am very proud that we built a top quality facility in a very short time. At some point in time we decided we wanted to sell it as we felt we were not cut out to do that kind of work. Not everything you do is right but this one came out really well and I am glad that the hospital is doing exceeding well. Recent decisions by the National Green Tribunal (NGT), which barred sales of vehicles having diesel engines have impacted your business. What is your take on it? We were affected by the decision of the Supreme Court to stop sale of 2000cc+ diesel cars in Delhi. This ban has been removed. As a company and person, we have always pushed for global regulations in the auto industry as we are on a mission for safety. We see it like this. A human being here is no different from a human being anywhere else and you have to have the same level of safety and emission regulations. Emission is related to fuel availability so we are manufacturing Bharat Stage 4 equivalent of Euro 4. We have always produced vehicles that meet all the environment laws. It took us some time to explain to the court. Now the regulation is changing to Bharat Stage 6 in 2020 and we are fully supporting it. Likewise even though there is no regulation, we are following all international safety regulations in all our vehicles and they meet all the crash tests and we are four star and above in all tests. These things I am very clear that we will follow global standards whether stipulated or not. What are your expectations from the Union Budget 2017? The first is stability and then lower income taxes for middle and lower middle class especially raising the minimum amount. What are the key challenges and opportunities for the auto sector in India? India has one of the lowest investments in mobility per capita in the world so there is a lot of headroom to grow. We have to grow along with infrastructure development. Mobility is important for the growth of the nation. Also our focus is on our existing customer base and we are working on ensuring our vehicles help them to upgrade or replace when the time comes. I don’t know if we will ever get into small cars and as of now I frankly do not have interest on it. I want to concentrate on our existing customers and existing line of products in the larger range. You seem to have culinary skills that are not much known. Tell us more about it? In school I used to do a lot of aero modelling and sculpt and make model airplanes and also play badminton. In college I would do a lot of art like sculpture and painting and continued aero modelling but at MIT I realised that I could not do both together so I stopped. But at MIT, I learnt a lot about art, music, theatre and humanities and I spent a lot of time on music. Now-a-days I spend a lot of time on cooking. Dishing up a meal is like making a painting or a sculpture and I am always competing against my last meal. I do not really cook the same thing twice. What is your life like outside work? I finish work fast and can go through papers very fast and now I can spend time doing what I like. I enjoy music and reading. My wife Geetanjali is a big time golfer. But for me the best time is that I can spend with Manasi and Geetanjali doing anything together. Of course, I want to grow our business and make sure that my daughter Manasi is properly settled both in business and personally. I have made many institutional commitments to CII and the like which are important and a new learning experience. We are emphasising our participation in CSR (corporate social responsibility) and PSR (personal social responsibility). Also I want to better manage my time so that I can do more things with Geetanjali and Manasi, travel more and golf more! What is your definition of achievement and what does it mean to you? When I was younger, achievement was about making a good sale and giving a good product. Now, as I am reaching the end of my career things are changing. I used to look at my company performance as an important achievement but now after more than 35 years of working, I feel it is more important to measure my achievements through what I have done for society and for the progress of our nation. This is like the hospital we sold, I am just happy it is doing good for that area and its people. I feel that knowledge and an ability to never stop learning and of course – humility are qualities that are a must in a leader to become a high achiever. I have created more jobs and that gives me a lot of happiness as my focus now is on giving back to society and the nation.